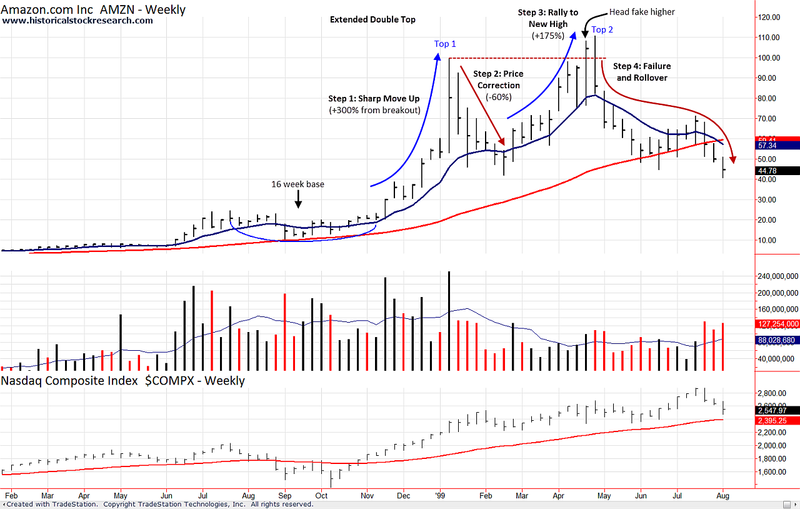 An Extended Double Top is a topping behavior that occurs after a stock has already made a large move higher (at least a doubling of price) in a short amount of time (less than 1 year). A stock breaks out of a base and has a sharp move higher (not many pullbacks) that keeps the majority of investors out of the move. Price breaks lower and shakes out some investors. After finding a low, price reverses and goes back to new high ground. Price fails to hold above Step 1's high and rolls over or trades sideways as "dead money". Note: Steps 2 and 3 may feature a sharp break lower that's followed by a fast move back to new highs. Please >>CLICK HERE<< for the historical chart examples of Extended Double Tops. Please >>CLICK HERE<< to go to 1st Swing Point High Tops.